Edouard Duval-Carrié is an internationally significant Miami-based Haitian-born artist who creates colorful, socially and politically oriented narrative art that channels his knowledge and fascination with Haitian history, spiritual beliefs and folklore. 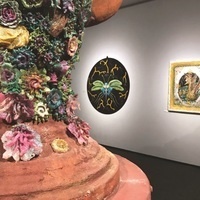 For Decolonizing Refinement Carrie’s art is combined with historical artifacts related to Florida’s agricultural labor history borrowed from south Florida regional historical collections. The project was devised by a team of art history scholars with Carrié at Florida State University where a version of the exhibition was first presented in Spring 2018. The aim of the FSU art historians is to expand understanding of Caribbean visual culture and the arts of the African Diaspora by implicating the colonial heritage of Florida and the broader Southeastern U.S. in circum-Caribbean histories. The exhibition employs Duval-Carrié’s recent works, which critique the Francophone history of Caribbean representation, as agents of “decolonization.” The Museum of Fine Arts at FSU organized the exhibition and published a catalogue with several essays by the FSU art historians and other scholars. Khaulah Naime Nuruddin, University Galleries, FAU Museum Education Coordinator serves as curator for the FAU version of the exhibition. A sister exhibition and public programs will be presented concurrently at the S.D. Spady Cultural Heritage Museum in Delray Beach.